Filtration is defined as the passage of a fluid through a porous medium to remove matter held in suspension. Filtration is a very simple process. As the fluid (in this case the pool or spa water) passes through a media of sand, diatomaceous earth or fibrous material, particles are trapped within the grains or fibers of the filter media. Larger particles are trapped on the immediate media surface, while smaller fragments can be found at varying depts. Only those particles smaller than the media's filtering capacity (measured in microns) will pass through the filter bed. A micron is equal to 0.001mm. Also remember that proper pump sizing and recirculating piping is paramount to achieve good filtration. Flow rate must be swift but not too swift. Flow rate is the rate of flow through the recirculation system. Flow rate is usually expressed in liters per minute (LPM) or gallons per minute (GPM). Every pool and spa should be equipped with a flow meter. The turnover rate can be determined from the flow rate and the pool or spa volume. Turnover rate is the time required to recirculate the entire volume water in a swimming pool and spa or hot tub. For pools the turnover rate is usually expressed in hours. In spas and hot tubs it should be expressed in minutes. Proper turnover time is essential to ensure optimum water clarity. Although important in residential pools and spas, proper turnover rate in commercial operations is critical. Bather load must also be taken in consideration. Want to know how much water is in your pool? 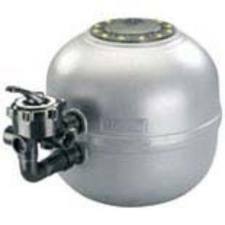 If you need more info on how to change the sand from your sand filter then don't forget to read tomorrows blog! !